For two years, I was proud to be a contributor at A Deeper Story. I wrote alongside many amazing authors, writers, and poets, often wondering how on earth I got so lucky. I often felt unworthy. They were the Alice Coopers to my Wayne. Nish Wiseth, the founder and chief editor, has decided the time has come to move on, so she is closing up shop. I’ve decided to re-post my work from there here. Every Saturday, a new-to-Lifenut post I wrote for A Deeper Story will appear here (with Nish’s blessing and encouragement). These posts often focus on issues of faith, culture, church, and how they intersect through story. I am very fond of these posts and don’t want them disappearing. Folding them into Lifenut is like folding chocolate chips into cookie dough. The ditch was nearly a half-mile long. It bordered a farmer’s land to the south and brought irrigation water to his corn. A two-lane country road bordered the north side of the ditch. That was the road my sister and I took to pick wild asparagus. Our plastic baskets with garish plastic daisies carried our organic harvests home, up a steep driveway and into our mother’s newly-revised dinner plans. She was always so gracious when we’d arrive home, sweaty and beaming. Of course, we can eat the asparagus! Sometimes, she joined our ditchside hunts. That meant our little brother had to come. I wasn’t very happy about having helpers. The more they picked, the less we picked. Every load of asparagus was seasoned with mounds of salty pride. When my mom praised our haul, then prepared it and served it, I was supporting our family in a small way. Me, a provider? Collecting those thin green stalks was my first taste of self-sufficiency. Wild dreams of surviving as a pioneer seemed reachable. Look out, Laura Ingalls: I had a banana-seat bike with a basket, three hundred mosquito bites on my legs, and a song to whistle. Western Meadowlarks lived along the ditch. They have a very distinctive song. They called to each other as we snapped stalks. At the time, I didn’t know I was paying attention to them until my brother said, “Those are asparagus birds.” We never saw them, but we heard them. I wouldn’t be able to pick out a Western Meadowlark in a police line up. There’s Big Bird. Tweety. Foghorn Leghorn. Some random bird. Sam the Eagle. Woodstock. Sorry, officer, I don’t know who did that to your cruiser. But if you play a recording of a Western Meadowlark singing, I’ll be 10-years-old with dirt under my nails and a theory; sticks of melted butter makes almost anything more tolerable, especially asparagus. After all that work, fueled by all that pride, I never admitted to anyone that I didn’t like the asparagus we picked. I did it solely out of love. Wouldn’t it be ironic if it turned out they all hated asparagus too? Perhaps they ate it just to please me? What a vision: Five people eating asparagus they hated because each believed it meant more to the others than themselves. The Western Meadowlark sings on and on, never changing her call. They nest in the grassy plains of North America and have a wide range; yet they all sound the same. 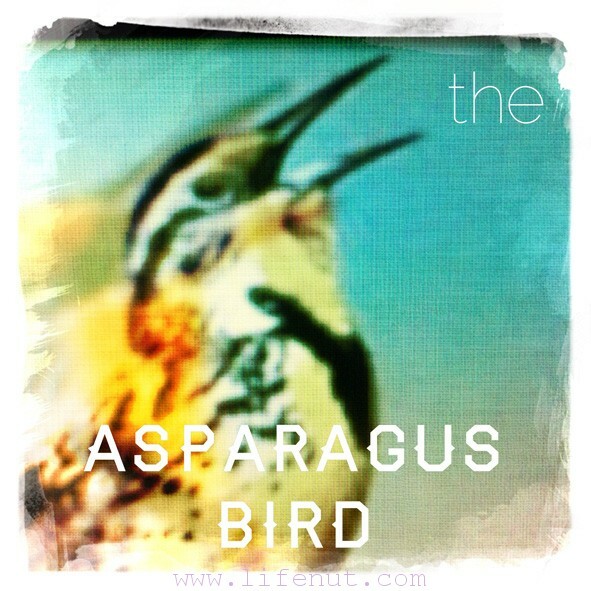 Our asparagus birds lived in the high desert of western Colorado. There are some things that never change or fade, some things that feel eternal and good. The ache of leg muscles as they power a banana-seat bike up a driveway felt eternal and good. I could have brought my mom food forever, but winter came and eventually someone laid pipe in the ditch and covered it with dirt. No more asparagus. No more pretending to like asparagus. It was time to move on from bike to car, from my parents snoozing in the bedroom across the hall to snoozing on the other side of the state. But if we gathered in the same room again and a Western Meadowlark swooped by and perched on a branch, she’d have to say something. They’re chatty.